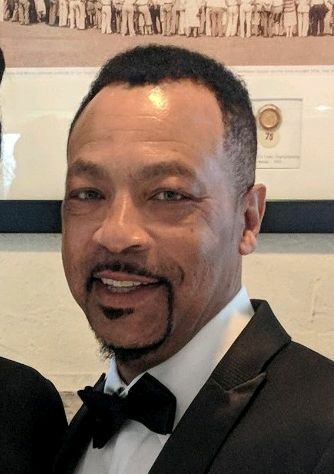 Obituary for Kevin Darnell Wright | Jones Clark Funeral Home, Inc.
Mr. Kevin Darnell Wright, age 54, passed from this life on Thursday, November 29, 2018 at approximately 9:08 p.m. at his residence in Lima surrounded by his loved ones. He was born on September 15, 1964 in Lima, Ohio to the union of John E. and Patricia Ann (Lester) Wright, Sr., his father is deceased and his mother survives in Lima. On March 10, 2001 he was united in holy matrimony to Tiffany A. Ward, who survives in Lima. Mr. Wright was a retired veteran of the United States Marine Corp and served in the Gulf War. He was the founder of TEAR (Training, Education, Academics and Recruiting). He was a former coach for the Shawnee Girls Basketball program; he also coached for the Lima Sparks AAU Team. Kevin was a hero to many. He leaves behind a legacy of being a wonderful husband, father, grandfather, son and brother. He was a kind, caring man, an amazing friend, coach and an inspiration to anyone who had an opportunity to meet him. Kevin was an overall beautiful human being. Besides his loving wife Tiffany he leaves to cherish his precious memory, 4 daughters; Amber R. Wright of Lima. Shavae L. Wright-Robinson (Stephen) of Columbus, OH, DaQuaela D. Wright of Dayton, OH and Samya B.Wright of Lima. 5 grandchildren; Aviaire, Aityana, A’shani, Karson and Aubree. 1 sister; Denish L. Evans of Troy, Ohio. 5 brothers; John E. Wright, Jr. (Tuneka) of Findlay. Stephen L. Wright (Renatta) and Marc E. Wright both of Lima. Timothy W. Wright (Tammie) of Dayton and Michael D. Wright (Debra) of Columbus, OH. A host of nieces, nephews, other relatives and friends. Home Going Services will be held Thursday, December 6, 2018 at 12:00 p.m. at Cornerstone Church with Pastor David Roberts, officiating. Visitation/Wake will be held on Wednesday, December 5, 2018 at 4:00 p.m. until 8:00 p.m. with the family present from 6:00 p.m. to 8:00 p.m. at the Chapel of Jones-Clark Funeral Home, Inc.